We are about to launch our enhanced design, slope ready Snoogee Boards. Tour + Kickstarter campaign coming soon. Subscribe to find out the latest and for early bird rewards. Join our wild ride and help us taking sledding to the next level. Dedication to the thrill and adventure of action sports led brothers Michael and Ben to create snow sleds that embody the freedom and flow of the action sport lifestyle. Michael’s passion lies in snowboarding while Ben’s first love has always been bodyboarding. It’s the fusion of these passions that formed the Snoogee Board. We want to share with others the feeling of freedom, opening up a mountain of possibility, experiencing sledding in a whole new way. We’re bent on pioneering the freshest ride on the slopes. An affordable board to make your snowboard more communal, share it with family on a small run nearby or take lifts to intrepid places with mates. Our revamped Snoogee has steerable carving edges that enable maximum precision, is versatile and can be used to sit, kneel, prone or stand. However you use a Snoogee, you’re going to get better steering and edges than you thought possible, with the safety being close to the ground. Snoogees are the first sled to be allowed on resorts. Take to the snow in brand new ways, the mountain never felt so fast as on a Snoogee Carving Sled. You don’t need to be at a resort to have the best fun in the snow. Ride small hills like waves, carving on this versatile board. You can go anywhere. You can share it around. You are free from bindings, so it is truly a flexible adventure. Snoogee Boards’ carving performance means that those wanting to enjoy traditional resort sled runs can sit down and carve around or even pass traditional wooden sledders. Sleds are not usually allowed on resort slopes. But the Snoogee sled has steering control that other sleds can’t match. One look at a Snoogee and lift operators wave them through. The control of the Snoogee is evident. Complete with a leash so you can stack with confidence. 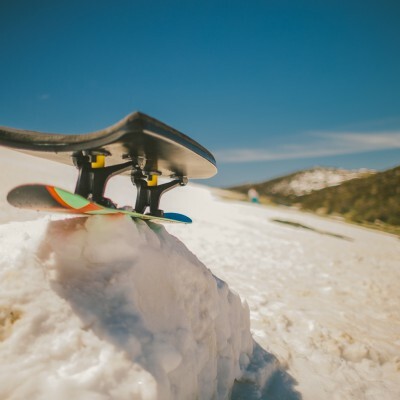 The Snoogee Board is the ultimate carving sled, taking sledding from basic snowplay to a fully fledged action snow sport by combining the control of a snowboard and the thrill of bodyboarding. 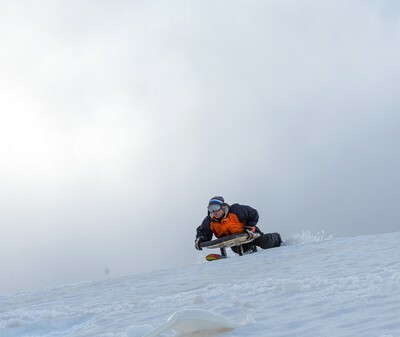 Ride close to the snow, feel the speed, hit the slope, carving in radical new ways. Our Snoogee has been totally redesigned, and we are releasing our new and improved price point. It’s an exciting time for snow. The latest Snoogee continues our dream of taking ASX to the slopes in communal, accessible, fun ways. Share and carve like never before. The Snoogee Sled is a sled like no other. With the control of a snowboard, but the fun of bodyboarding. Ride close to snow. Feel the speed. Hit the mountain in new ways, carving through kicks and flips and turns.